For a quick-and-easy flavorful snack, I’ve yet to find something that rivals popcorn, and this recipe is no exception. The matcha and minty chocolate go together oh-so-nicely. Plus, on a chilly March day, who couldn’t use a little caffeine and antioxidant boost? 1. Line a large baking sheet with a silicone baking mat or wax paper. 2. In a double boiler, melt chocolate chips. Mix in 1/2 t coconut oil and peppermint extract; set aside. 3. Add popcorn to a large bowl. Add remaining melted coconut oil to popcorn and mix well. Sprinkle matcha and salt over popcorn and mix well. 4. 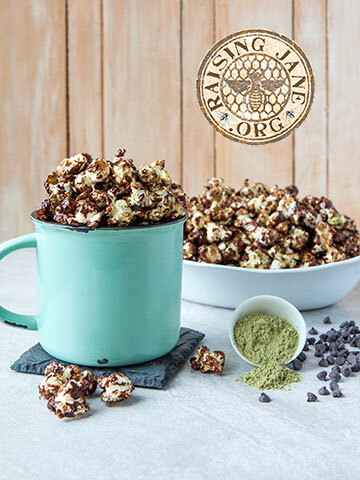 Drizzle melted chocolate over popcorn and mix well. 5. Pour popcorn onto prepared baking sheet and spread out. Cool until chocolate is set (about 45 minutes). Break up any large clusters and enjoy immediately or transfer to an airtight container and enjoy later. Thanks for adding the print feature. Awesome. Grand kids and I will love not only the popcorn,, but chocolate and peppermint.